The good folks at Miss(ed) Manners have done it again: they’ve recreated one of J.R.R. 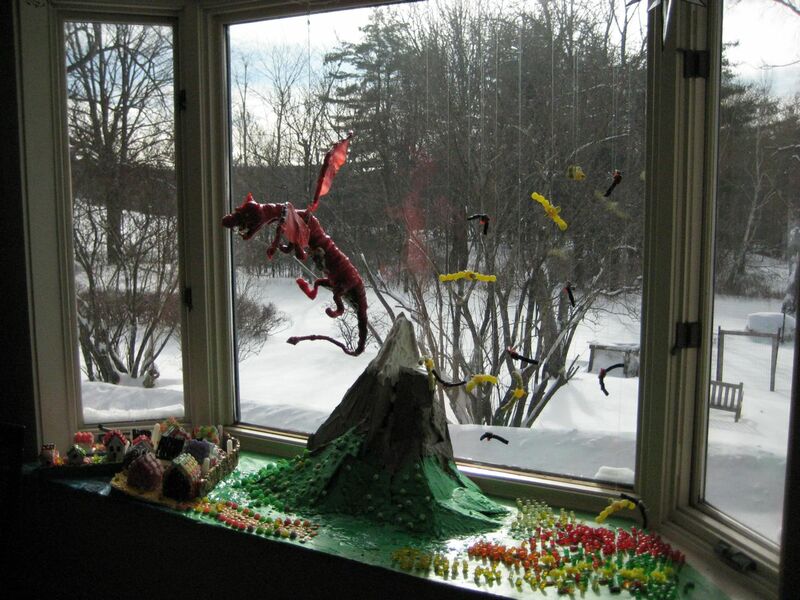 Tolkien’s most epic scenes … in candy. This time around, it’s the conclusion to The Hobbit, featuring the Battle of the Five Armies and the assault on Lake Town by the dragon Smaug. As with their previous creations — The Battle of Helm’s Deep, The Battle of Pelennor Fields, The Mines of Moria, the diorama is truly a sight to behold. A red licorice Smaug rises from a frosted Lonely Mountain to ravage a gingerbread Lake Town. Gummi bear armies of goblins, orcs, humans, dwarves and elves battle for the treasure under the mountain, while overhead eagles and giant bats fight for ariel supremacy. Great stuff, and it’s got me thinking about upgrades for my own gingerbread creations next year. The Battle of Hoth anyone?